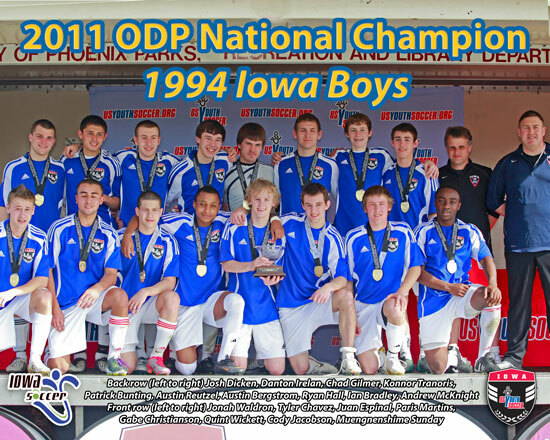 DES MOINES, Iowa (March 8, 2011) – On Sunday, March 6, Iowa Soccer's 1994 Boys Olympic Development Program (ODP) team captured the state's first-ever National Championship of any kind at the youth soccer level by defeating California-South, 4-1. The win comes on the heels of taking down another warm-weather state, Florida, 3-1 in Friday's semifinal at the Reach 11 Sports Complex in Phoenix, Ariz.
To put into perspective the outstanding achievement, the team not only defeated teams that have been training outside during the winter, but also that come from state associations that have among the highest numbers of registered players in all of US Youth Soccer. "For a state the size of Iowa to beat Florida and Cal-South in the National Finals, and win a National tournament that started last summer with state teams from all 55 State Associations is a phenomenal achievement," said Iowa Soccer Director of Coaching Ian Bradley. Coached by Andrew McKnight of Iowa City, the squad totaled seven goals in two matches, while giving up only two. In the victory against Florida, Gabe Christianson scored the opener at the 27th minute, with Tyler Chavez following at the 54th to open up a 2-0 lead. Florida scored in the 90th minute, but Iowa responded within seconds when Chavez struck gold a second time. In the Championship, Danton Irelan put Iowa ahead with a tally 26 minutes in. Christianson scored what ended up as the game-winner with 20 minutes to play on a penalty kick. Cal-South struck with 13 minutes to go to pull within 2-1, but Irelan and Quint Wickett shut the door on a comeback with goals in the final five minutes. Patrick Bunting tended goal for Iowa in both matches. McKnight shared his post-game reaction, "What a special moment at the final whistle, having the opportunity to see the reaction of the players, knowing how badly they wanted to succeed and knowing how hard they had to work to do it. It was very special." The Iowa team is no stranger to the National Championships, having competed there in 2010 after winning the 2009 Region II ODP Championships -- or to international competition – taking on Brazilian youth teams during a two-week tour there in 2009. The team also won the 2008 Region II ODP Championships, but at that time, no National competition was conducted for that birth year group. Age group winners from each of the four US Youth Soccer Regions (Regions I, II, III and IV) are determined in summer preceding the National Championships. The '94 Boys' bracket was rounded out by Eastern Pennsylvania, another "large state" association. Team members include Austin Bergstrom (Cedar Rapids), Patrick Bunting (Ankeny), Tyler Chavez (Iowa City), Gabe Christianson (Cedar Rapids), Joshua Dicken (Johnston), Juan Carlos Espinal (Muscatine), Chad Gilmer (Cedar Rapids), Ryan Hall (Tiffin), Danton Irelan (Ottumwa), Cody Jacobson (Johnston), Paris Martins (North Liberty), Austin Reutzel (Swisher), Muengnenshime Sunday (Iowa City), Konnor Tranoris (West Des Moines), Jonah Waldron (Adel), Quint Wickett (Bettendorf). Of the players, McKnight stated, "The players were very aware that they were representing their families, their club coaches and the state of Iowa. They represented you all very well in every department." Iowa ODP teams are formed when players try out and are selected to compete on their age group team that represents the state at ODP events. Various additional competitions and training offers those players exposure to the nation's best coaches, trainers and facilities, as well as opportunities to advance up the ODP ladder. Last July, Bunting, Chavez, Christianson, Dicken, Irelan, Reutzel and Sunday all were selected to the Region II '94B ODP pool.